An actual city, with real people! Day 42: TO COLORADO SPRINGS!!! Finally ending our 9 day stretch of riding! 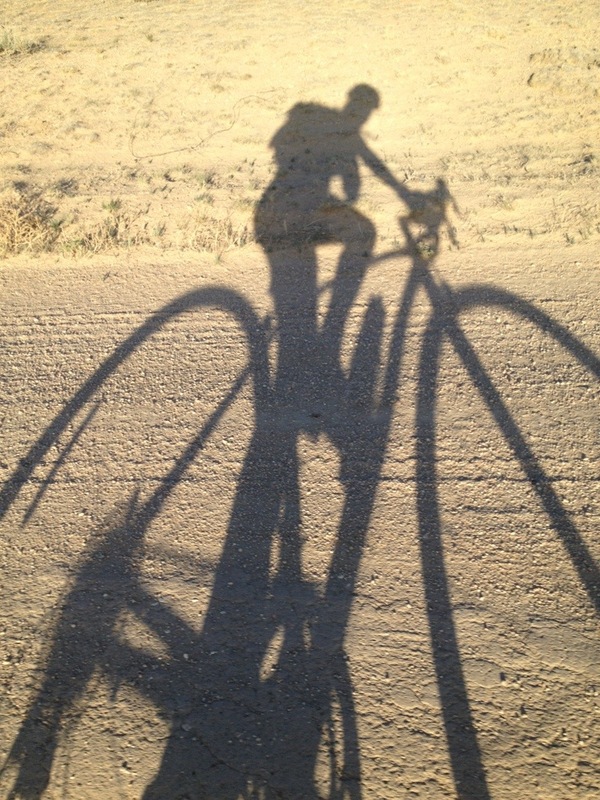 It was only a 45 mile ride, and I hoped that my enthusiasm for getting to an actual Colorado city would be enough to get me there, as I was beyond exhausted from riding all day everyday for over a week. We left from the campsite and eventually turned left onto HWY 94, which was the first road to shoot us directly toward the beautiful Rocky Mountains that we’d been looking at for days!! I meant to take a photo of this site, but I forgot to. 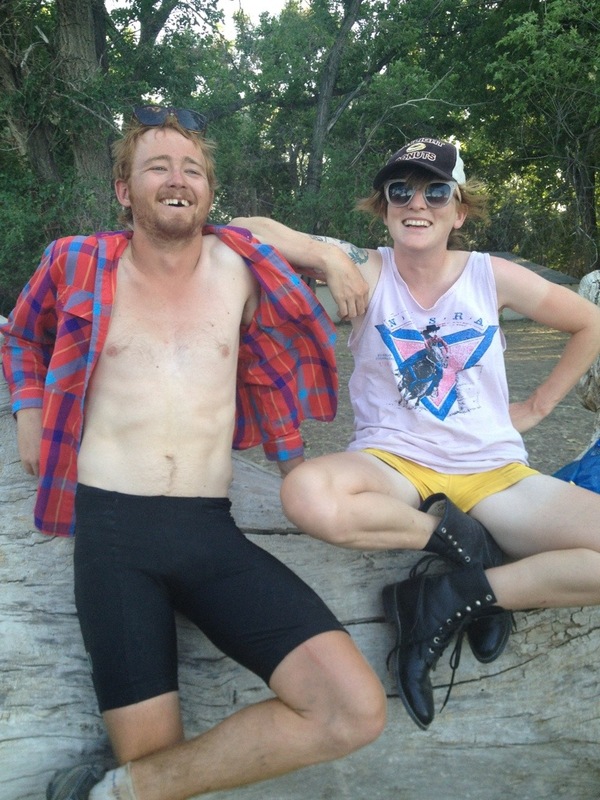 Instead, I will insert a photo of Sam and Meg being mountain redneck gingers. We saw a Starbucks once we got farther into town and since there was no coffee shop at the campsite/ranch, believe it or not, we HAD to stop! We were only 5 miles out from the host, but coffee was way more important than getting there. We stayed there for so long that we considered vanning ourselves for the last 5 miles (we didn’t, but we strongly considered it). 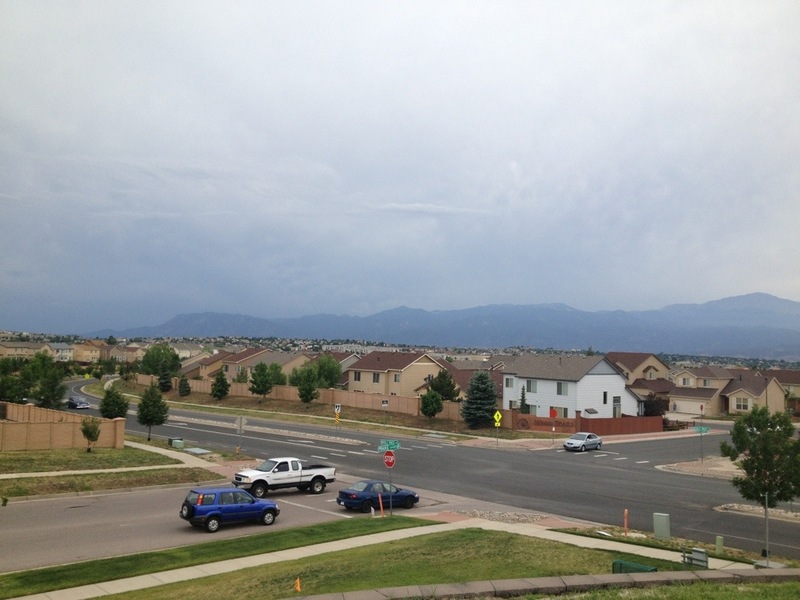 Even though Colorado Springs is more “suburbia” than I would like (you just see rooftops upon rooftops as far as the eye can see), we were SO HAPPY to be in a CITY. People outnumber cows here… There are multiple restaurants and businesses… There are stoplights… All of this is a really big deal!! We had been used to biking in the middle of nowhere, hoping that the barely visible water tower in the distance meant civilization was ahead. We were going to be in a city of over 400,000 people!! When we arrived, Lindsey, the Colorado Springs Habitat Volunteer Coordinator hooked us up with dinner and plenty of snacks for our weekend stay! This entry was posted in On the road! on June 30, 2013 by murphykg. Well, there isn’t anything like the lack of civilization to make you appreciate the it when you have it back in your sights. And then, you’ll be glad to get it behind you soon enough. I was glad to hear you had a short day of cycling- ONLY 45 miles ! I guess this means you are close to the halfway point of your trip. Which is good, the mother in me comes out when I read your “dailies”, and I am looking forward to reading the next installment of your adventure, as well as your safe return home. But I believe your positive attitude and great outlook on life is going to get you through this, as well as all the events in your life. Attitude is everything.